Josh Stackhouse updates his “old school” gradebook on a computer at the Fairfield Local Schools near Leesburg. Jenny Smallridge, Josh Stackhouse and Ellen Binegar are all sixth grade teachers at Fairfield Middle School and bring a common attitude to the table — passion. Smallridge brings 23 years’ experience to the district and teaches science and social studies. Josh Stackhouse is the “new kid on the block” at Fairfield Middle School, entering his first year as a full-time teacher after having been a student teacher last year. He echoed Smallridge’s sentiments about the upcoming term. “We have a lot of new people in the district,” Ellen Binegar added. She teaches sixth grade reading and brings a decade of experience to the classroom. The trio of teachers realize that they’re dealing with a group of young people that are about to enter the awkward teen years, and they want to make their time in sixth grade interesting and fruitful. Building strong interpersonal relationships is the key, according to Binegar. “Actually interacting, and learning with and from each other, not all this shallow online stuff we keep hearing about,” she said. To Stackhouse and Binegar, making sure time in school doesn’t become drudgery is personal. Binegar has a daughter starting kindergarten and Stackhouse’s son will be a first grader. Situated just outside the Leesburg village limits, Fairfield Middle School finds itself in a largely rural surrounding, which has its advantages and disadvantages. Though her school district is keeping pace with the demands placed on it by today’s educational system, Binegar has concerns from both a teacher and parental standpoint. “My big concern for the district is the challenges of technology and access, and are we as a district keeping up with the world at large,” she said. Fairfield schools are getting more technology classes started for the younger grades, and Binegar noted that the fifth grade alone is doing much more keyboarding classes, and building internet and information technology resources. Stackhouse would like students to not be so reliant on technology, but develop what he calls some “old school” concepts. Stackhouse added that those real-world life skills he advocates will help them in later years to balance a checkbook, fill out a job application and confidently go on a job interview. Smallridge spoke about her worry as to whether her students are getting the attention they need at home and how encouraging it is when a parent calls, emails or stops in for a visit. Binegar was quick to say “it’s great to be a Lion” and encouraged a triangle of teaching that involves teachers, students and their parents. Reach Tim Colliver at tcolliver@aimmediamidwest.com. 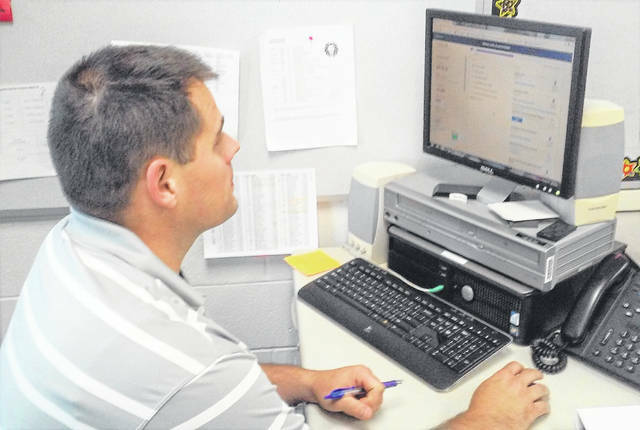 https://www.timesgazette.com/wp-content/uploads/sites/33/2018/08/web1_Fairfield-pic.jpgJosh Stackhouse updates his “old school” gradebook on a computer at the Fairfield Local Schools near Leesburg.